The Apple iPad Air 2019 is the third iPad Air generation with a 10.5-inch screen and pricing that starts at just 499 US Dollars. I’d say it is an upper middle-class tablet set between the standard iPad and the iPad Pro versions. It offers a laminated Retina screen, a fast A12 Bionic processor, and the Touch ID fingerprint scanner. Here is everything you should know about the Apple iPad Air 2019. Even though the iPad Air 2019 features new internal hardware, its design is almost identical to the iPad Pro 10.5. It features a full metal body, rounded corners, and is just 6.1mm thin. The Air weighs 456g, has bezels around the screen, and a home button with integrated Touch ID underneath the screen. We also get a Lightning connector and a standard headphone jack. Yes, no USB C with this one. Next to the Lightning port are two speakers. So, we don’t get four speakers as we do with the iPad Pro lineup. The iPad Air 2019 has a 10.5-inch screen. It is an IPS panel with a “Retina” resolution of 2224 x 1668 pixels. That means it has a pixel density of 264ppi. In this case, Apple is using a fully laminated screen with an anti-reflective coating and its True Tone technology. That means the white balance of the display is adjusted according to its environment. Underneath the screen, we get the same Apple A12 Bionic processor we are used to from recent iPhones already. When buying the Air, you can choose between 64GB and 256GB of internal storage. You can also get a cellular 4G LTE version. The cameras offer a resolution of 8 and 7 megapixels. It also features WiFi ac, Bluetooth 5.0, and, with the LTE version, GPS as well. Apple is offering a couple of cases for the iPad Air 2019. A more interesting accessory is the Apple Pencil though. Yes, this tablet is supporting the original Apple Pencil that we know from the original iPad Pro lineup and the simple iPad 2018. However, Apple Pencil 2 is not compatible. In addition to that, you can also get an official Smart Keyboard for this tablet. Actually, it is exactly the same keyboard that works with the iPad Pro 10.5. Apple announced the third generation iPad Air 2019 on March 19th 2019, with it slowly getting available in the following two weeks. In the US, prices start at 499 US Dollars. If you want to get 256GB, you have to pay 649 US Dollars. You have to add 130 US Dollars for the cellular versions. In Europe, prices usually start at 549 Euros. 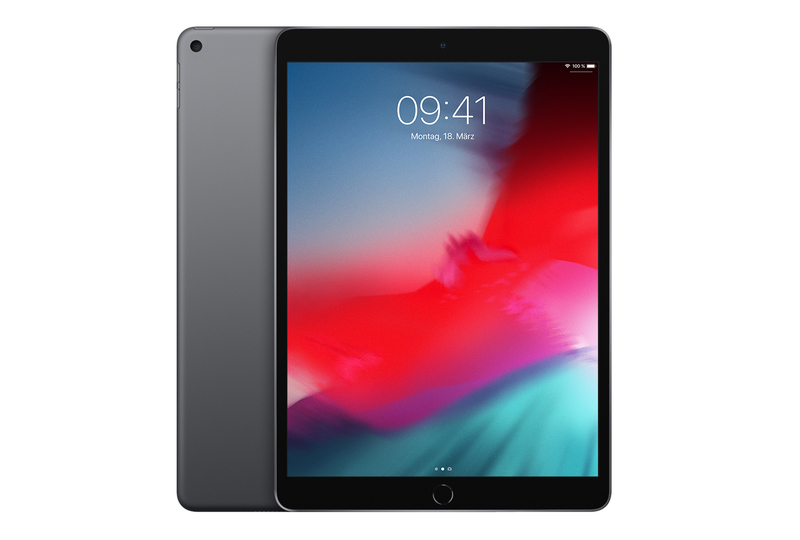 From the start, the iPad Air 2019 is released in Australia, Austria, Belgium, Canada, Czech Republic, Denmark, Finland, France, Germany, Hong Kong, Hungary, Ireland, Italy, Japan, Luxembourg, Netherlands, New Zealand, Norway, Poland, Portugal, Singapore, Spain, Sweden, Switzerland, the UAE, UK and the US. Countries like Colombia, Greece, India, Israel, Russia, Saudi Arabia, South Africa, Thailand, and Turkey are following shortly after. I’m sure that other countries like Taiwan, South Korea, Indonesia, and the Philippines will follow too. Let’s check out some possible alternatives to the iPad Air 2019. If you want to stay in Apple’s universe, you could check out the standard iPad 2018. While it offers a smaller 9.7-inch screen and a weaker processor, it is much cheaper too with prices starting at just 299 US Dollars. If you need more performance and would like an updated design, you can check out the new iPad Pro generation. It features a faster processor, a nicer design, USB C, four speakers, and Face ID. However, it is very pricey. There are tons of alternatives running Android too. Among those are the Samsung Galaxy Tab S5e, Samsung Galaxy Tab S4, and Huawei MediaPad M5 10.